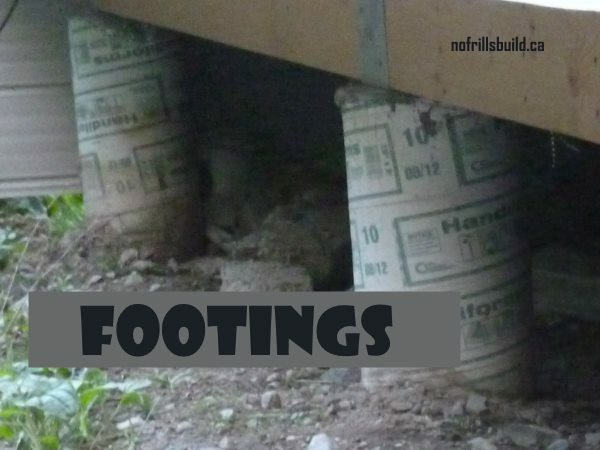 Footings - what else would Pearls Place stand on? 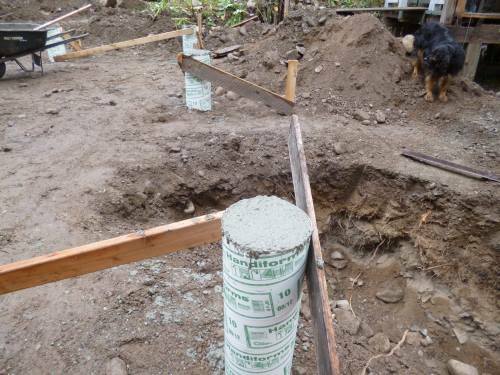 With a budget this small, the foundation of the project has to save as much money as possible; Big Foots with Sonotubes to hold the concrete make the most economical sense for footings. We're all about spending less money. 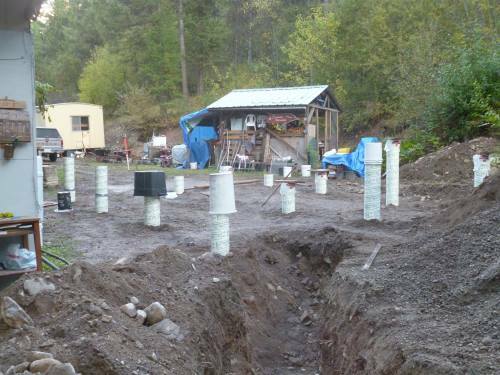 After excavating the holes, these are put into place, leveled and then back filled; then they have to be inspected before back filling and pouring the cement. High embodied energy, the cost of creating and shipping any product, is by necessity high in concrete. 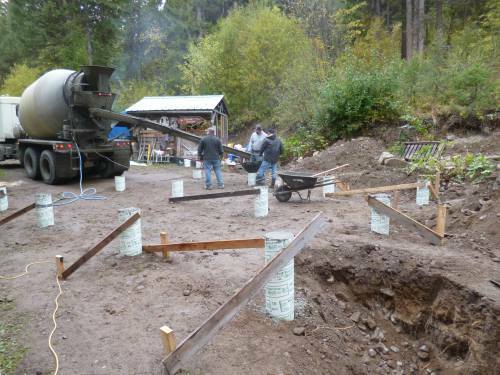 Not only does the powder have to be manufactured, but the product itself, mixed concrete, has to be transported from the supplier to the site. As it's heavy, and needs to be constantly mixed, the cost of the trucking can sometimes exceed the cost of the actual concrete. You'll always have too much, because unless it's batched, or mixed right on site, the supplier sends a little extra to make up for faulty calculations or miscommunications. 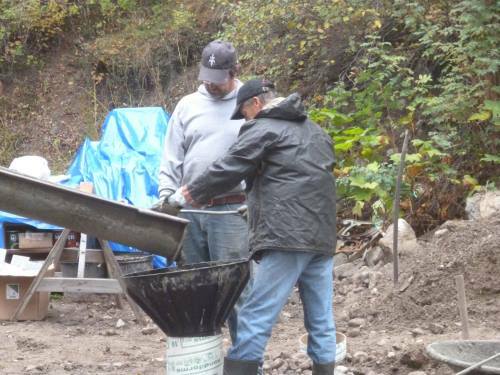 Always have a few pieces of poly film and some boards ready to make a step or pavers with the extra so it doesn't go to waste; if you don't use it, the driver of the concrete truck will usually find a convenient culvert that requires a bit extra on the edge, or simply dump it over the bank, sometimes in exactly the wrong spot. 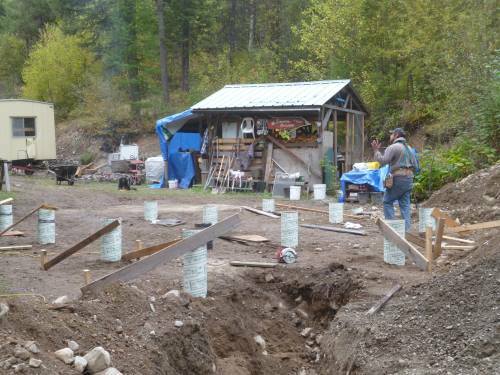 We decided to use the pier type of footings for our tiny house project because of the lesser amount of concrete needed. 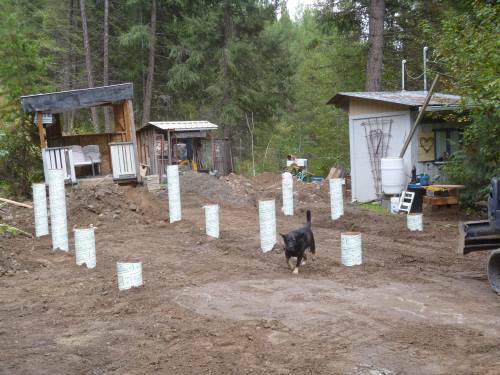 The concrete for perimeter footings and crawl space walls would be more than ten times more, require the rental of plywood forms (or the even pricier Styrofoam forms) and more time to set. 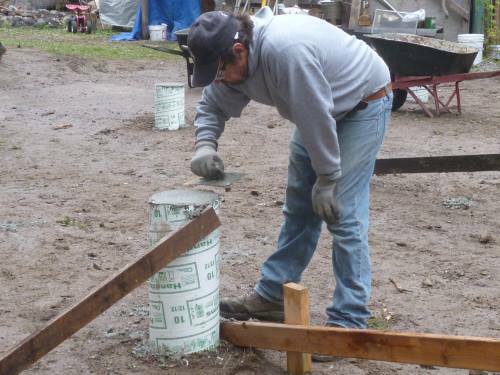 Each concrete pier had a metal bracket or saddle installed to hold the main beam. One more hurdle out of the way; fingers crossed, now we wait for 24 hours to let the concrete set up. Concrete is a funny material; it requires age to cure, and there's no hurrying it. After ten days, the forms can be stripped to ground level, but with so many other jobs to do, this might wait until the structure is completed. 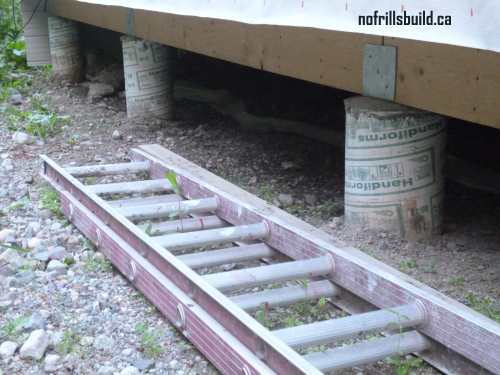 This kind of footing, known as piers or stilts, is sometimes not accepted by insurers, even though it's an acceptable and approved method from a building inspectors viewpoint. Make sure you are able to get insurance coverage!